On Saturday my wife and I had the opportunity to “have dinner with” the first man to set foot on the moon, Neil Armstrong. It happened to be almost exactly* 43 years after that spectacular event. Like many kids who grew up in the 60s and watched that history being made, Armstrong was a hero to me, so when I got the opportunity to do this, I of course leapt at it. Armstrong was in Flagstaff, Ariz., for the “first light” celebration of a new telescope at the Lowell Observatory there. Lowell, established in 1894, is one of the oldest observatories in the United States; it’s where Clyde Tombaugh discovered Pluto, in 1930. Pluto has a special place in my heart: my boss at the Jet Propulsion Laboratory conceived of the robotic mission to the planet; I worked on the pre-project in my later years at JPL, and used This is True to help promote its funding …which led to my being invited by the mission’s Principal Investigator to the mission launch in January 2006. There, my wife and I met Tombaugh’s widow, Patsy; I had previously been on a telecon with Tombaugh himself. Of course, as a young and awed lad I watched live as Armstrong was the first human to step on the surface of a celestial body other than Earth. The “first light” of a new telescope celebrates the end of its construction, when it’s finally able to look up and see its first image. At the gala we were shown that image: a beautiful, crisp, clear spiral galaxy. The new telescope at Lowell is called the Discovery Channel Telescope since a significant portion of its construction costs were first underwritten by the cable network (and some personally donated by the network’s founder, John Hendricks). It’s a big one: it has a 6,700-pound, 4.3m primary mirror (170 inches), which took three years just to polish. It promises to bring back some amazing discoveries: the observatory has hired a few new astrophysicists to work on it. One of those is the wife of a good friend, which is how Kit and I ended up invited to this. Celebrating the new telescope was pretty cool, but a lot of us were really there to hear the keynote speaker: Neil Armstrong. Let’s just say we — the 735 of us in the room — were not disappointed. Just on his reputation and accomplishments, Armstrong got a standing ovation even before he started. He recounted the earliest astronomical science accomplishments: how Tycho Brahe (1546-1601) worked to map the stars, which led to Kepler’s Laws of Planetary Motion, which provided the foundation to Newton’s theory of universal gravitation, which led to the industrial revolution, which immeasurably improved the quality of life for everyone in the world. That, Armstrong pointed out, is an example of the value of basic research. Armstrong gave us a quick overview of an experiment he installed, the Lunar Laser Ranging experiment. By placing a special retroreflector mirror on the moon pointed at the Earth, scientists at observatories could shoot a laser beam at the moon, which would be reflected by the mirror back to them. Using a super-accurate clock, they could then very precisely measure the distance to the moon — at the time with an accuracy of 11-17 inches — a tiny percentage of the quarter-million miles to the moon …and back. Pointing it at Earth is relatively easy: while the moon sweeps across our sky at night, the Earth is quite stable in one spot in the moon’s sky, because the moon always has its face toward the Earth. “I wasn’t one of the scientists on this project,” he continued. “I was a sort of a technician. My job in the experiment was to install the mirror.” The moment he got it set up, researchers at the Lick Observatory in San Jose, Calif., started shooting laser pulses at it. He rolled his eyes a bit that they didn’t give him a “head’s up”! Yeah, I’m sure he’s used that joke many times before, but we ate it up. That mirror, the retroreflector pictured above, is still operating 43 years later, and accuracy has improved to less than an inch, “which gives me enormous satisfaction as a technician on the project,” Armstrong said. And, by the way, it gives proof to anyone who can send a laser pulse strong enough to go the distance and back: that couldn’t be done before 1969, but it could as soon as Armstrong put it there. Proof that we really did land on the moon. That, and the Lunar Reconnaissance Orbiter is in orbit around the moon right now, sending back high-resolution photos of the moon’s surface. In those photos, we can see the items left there by the astronauts, including the bases of the lunar landers. He then took us through the last several minutes of the moon landing by the Eagle, the Apollo 11 lander. The Eagle’s landing computer weighed 70 pounds — and only had 32K of memory, he said. It overloaded on the way down, and the autopilot was taking the lander toward a large crater (about the size of a baseball stadium) with steep walls and strewn with boulders. Armstrong took over the controls to steer toward a better landing spot. That landing was documented by a 16mm movie camera pointed out the window, down toward the surface. He told us that an amateur video maker had used high-resolution photos from the Lunar Reconnaissance Orbiter, skewed the way Google Earth skews satellite photos to give an oblique view, that matched that camera’s view of the landing. LRO’s photos are so much better that camera (at least until the very end) that you can see the view much more clearly than you can in the 1969 film. And the view was wider: Armstrong said it very well matched the view of what he and Buzz Aldrin could see out the window. He got another standing ovation — this one twice as long as the first. Similar to the industrial revolution Armstrong talked about, Russia’s Sputnik — the first artificial satellite of the Earth — sparked the information revolution. Sputnik 1 launched in 1957, and it made the U.S. realize that it had fallen way behind in science and technology: the Russians were beating us. My alma mater, the Jet Propulsion Laboratory, responded to Sputnik with Explorer 1, launched just three and a half months later. It was not “just a satellite” — it had scientific instruments aboard to do (yes!) basic research: it found the Van Allen radiation belt (James Van Allen designed the experiment that found the “belt” of radiation above the Earth’s surface). The “space race” that followed propelled the U.S. into a tremendous period of knowledge: the U.S. space program needed a lot of engineers, astrophysicists, and other scientists who invented the technologies needed to get to the moon. It’s not all Tang and Velcro: it led to leaps in computer science, communications, medicine, the Internet, and other advances that couldn’t be anticipated any more than Tycho Brahe could have anticipated what his work would lead to. And it led to a gigantic increase in the quality of life for billions. We are losing the lead again, just like we lost it to the Russians. We are no longer turning out enough engineers and scientists. Foreigners used to come to the U.S. to study, and then stay here. Now they’re taking that knowledge home, in part because they don’t feel welcome to stay. Schools are teaching kids to take standardized tests (“what to think”), not teaching them how to think. President John F. Kennedy had the vision to fix a similar problem by challenging the country to send a man to the moon, and bring him home safely. In all, twelve men — all Americans — landed there, and all of them returned safely. That was a great accomplishment, but the billions of dollars spent didn’t get blasted into space, they were spent here, and we’re still seeing the benefits of that investment. But we’re falling behind again now, here in the 21st century. We need vision and guts and work to regain the lead, or we are destined to follow. Science gives us answers — and those answers can be tested. What other field promises that?! So yeah, when a landing computer overloads and starts taking you toward a boulder field right next to a huge crater, Armstrong was the right guy to take over. That was an easy problem for him. Some years ago, Armstrong said that at the time of launch, he guessed their chances of returning alive were about 90 percent, and the chances of a successful landing on the moon were only 50 percent. But he took the job anyway. That’s the kind of guts we need. Who will provide the vision? …about the date: The first moon walk was on July 21, 1969, at 2:56 a.m. UTC (“Universal Time”). In the United States, it was late on July 20. So the dinner we attended was actually 43 years and one day after Armstrong’s moon walk. …about the quote: Amateur researchers don’t always get things right. One had done an analysis of the audio of Armstrong’s first words upon stepping on the moon. 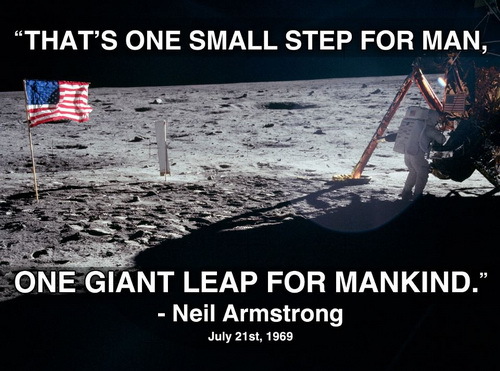 He meant to say “That’s one small step for a man, one giant leap for mankind.” The “analysis” showed that the “a” was said, just dropped in the radio transmission. But Armstrong admits that in the stress of the moment, he left out the “a”, leaving the sentence not quite making sense. He “prefers” that the “a” be included when it’s quoted. …about the lack of photos of Armstrong at the dinner: Sorry, not allowed. To get a photo, a $1,000-a-head donation to the Lowell was required for a pre-banquet meet-and-greet. Even if I had heard about it in time to do that, I didn’t feel I could justify the expense after driving here and paying for hotel bills. …last: The day I wrote and posted this entry, I found out that Sally Ride had died. She was America’s first female astronaut. I feel lucky that I got the chance to meet her, too, while I still worked at JPL. She was a class act for sure. She was 61, and died from pancreatic cancer. Armstrong died 25 August 2012, a little over a month after this dinner — his last public appearance. He had turned 82 just twenty days before. The image just above reflects the wishes of his family after his death. Related: My Behind the Scenes Tour of NASA’s Jet Propulsion Laboratory. Pretty cool, Randy! Good stories. Perhaps slightly off topic, but I just read yesterday that the American flag on the moon possibly only stood for a few days — during the mission. 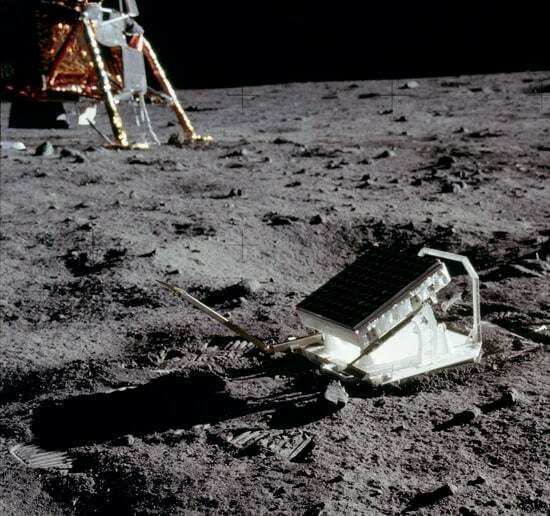 It is thought that it was likely knocked over by the exhaust from the lander as it ascended back into lunar orbit! So much for the theory of it being there for generations…. Well, that’s a theory. It’ll be interesting to see if the LRO photos can determine whether it’s true. I recall that one of the later missions pointed the camera on the lunar rover at the ascent of the astronauts when they left, and it shown the flag getting a mighty blast from the engine — but it didn’t fall. Thanks for sharing this, and helping keep the dream alive. About the quote: I watched the landing live on TV at the time. I was glued to that TV, knowing that the first words spoken from another world would be very important. What I heard in the live transmission was “One small step for a man…”. Then in the replay I heard, “One small step for man.” I was furious. I keep hoping that someone, somewhere, has a recording of the original words. So… Pluto? Planet or not? I know, you can’t tell us, we don’t have a high enough a security classification! As a young boy of about 8 years old at the time of this historic event of the first landing on the moon, I was glued to the television set in my parent’s living room at every available moment throughout the whole mission. This event also has a bit of personal significance, with the official landing date being July 20th, the birthday of my now deceased father. I agree with all your points in the “Have We Learned Anything” section. Hopefully it is postings like this that might inspire at least one young man or woman in this country to enter the fields of science or engineering and rejuvenate some of the “guts and vision” in this great nation that it took to put the first man on the moon. Thanks again for the great blog entry. Wow, I’m officially very jealous! I was only a month old when that great event happened, but it has partially defined my life and has definitely contributed to my dreams over the years! That spirit of adventure that carried us to the moon is what we need to keep us moving into the future now. I don’t buy the argument that we’re falling behind due to foreigners coming here for an eduction, then leaving for home. They are still educated, researching, and developing new ideas and products, and I expect they have much more influence being distributed around the world than all in one country and culture. Not only does that make it more likely they will not all think alike, it spreads the knowledge, much like a disease which spreads faster the more widely distributed its carriers are. I had heard more of the laser ranging story, which apparently was a bit of a mashup of several actual difficulties in getting the experiment to work. This page has the details; the part I find amusing was the 1700 foot discrepancy discussed at the very end of the article. Thanks for the story. We don’t hear enough from Neil Armstrong and any opportunity is to be highly valued! I am very jealous of you opportunity. Events like this and your story helps to keep the memories of those great times alive. I was just in High School in 1969 and followed all the Mercury, Gemini, and Apollo missions — so much I had all the details and NASA timetables / timelines for missions memorised! (Including the original timeline / plan for the Shuttle until President Kennedy rearranged things). The space program and the first walk on the moon have affected my life in a good way. I still look up at the stars and wonder and watched all I could about the Shuttle missions and the ISS. Neil’s pointed story about the usefulness of basic research should be widely advertised. Thanks again for relating the story! Agreeing with Fred’s comment above, we are falling behind, not because we don’t “produce” enough scientists, but because we don’t EMPLOY enough of them. Nor do we inspire enough interest around science, in part because we don’t inform the public sufficiently about the wonders and knowledge being created by scientists. It’s ironic that every newspaper has a daily horoscope, but none have a daily science column, and few have a regular science feature of any sort. I bet we are still leaders in one area, however. I bet we spend more money than any country in the world on promoting false science, on discounting real science, on creating obfuscatory controversy, on harassing scientists for coming up with inconvenient answers and information, and for denigrating the scientific method in general. I am surprised that no one has mentioned the video reconstruction of the landing and the skill and time it must have taken to construct. Modern technology combined with the expertise of a dedicated individual has enabled what was a rather limited and technically poor 16mm film to be brought to life. I particularly warm to the complete preservation of the original alongside the reconstruction. I was glued to the TV during the landing and even took a picture of the moon just after the landing — not that it looks any different to the moon today — together with the television image direct from the moon. It is an extremely poor picture but I know the significance of the image. I was amused to see that you nominated Michael Collins as this week’s Honorary Editor; I presume it related only to this blog post, not to the rest of the newsletter (though correct me if I’m wrong). However, I think it’s misleading to say he got s[ooo]o close (or, as I’ve read before, that he “went to the Moon and forgot to get off”): he makes it clear in Carrying the Fire, his autobiography, that he was offered the chance to command a later mission, implicitly Apollo 17, but declined for reasons including having viewed the Apollo program of which he was a part as leading up to the first landing (with subsequent landings being part of a later scheme), taking the view that “it is important that mankind explores, but it doesn’t matter a damn whether Mike Collins or any other one individual does”, and feeling that “I was simply not willing to spend that many days in simulators and nights in hotel rooms instead of with my family.” All of these were appropriate, even admirable rationale for the fact that he didn’t go back. On a separate note, I agree with Fred that the claim that we’re short of scientists and engineers are annoying — the problem is that we’re not used correctly (though seriously, emphasising STEM graduates is the easiest way to increase supply, not because they only want young employees — they want people to stay in the field for their whole careers (as long as their aspirations aren’t too high)). Logically, claims of a shortage should lead to us being better paid, but employers seems determined to avoid that even though they wouldn’t expect it to work in many fields. A big congrats. Meeting our moon heroes are going to get more and more scarce until there’s no more. I hope I get a similar opportunity too. His words are strong and true and hopefully senators listen with open ears. Buzz Aldrin confirms that the Apollo 11 flag was blown to the ground during liftoff. Various LRO photos of all of the Apollo landing sites, except for Apollo 11, show that the flags are still standing and that the flags are still casting dark shadows which move across the ground depending on the solar elevation at the landing site when each LRO photo was taken. The dark flag shadows suggest that the flag’s woven nylon material has disintegrated very little during the past four decades. Animations of several LRO photos show a bright piece of Kapton film near the LM. The piece of film is approximately a foot or two above the lunar surface. The present theory is that a small piece of Kapton film was blown off the descent stage during liftoff and got caught either on a kinked portion of the flag pole or on the end of the flag pole. If the latter, then the implication is that the flag is not resting entirely on the ground. Excellent blog. Very envious of your encounter with Neil Armstrong, a famously modest and private person. They say that success has many fathers, but Neil Armstrong has many brothers — more than 142,000 living members and alumni of his college fraternity, Phi Delta Theta. Armstrong is one of the alumni of whom we are most proud. I vividly remember sitting on the floor of the den watching the landing and the Moon walk. It was amazing, but at the time had no idea there would be recordings, reruns, video, Youtube, etc and I’d be able to watch it anytime I wanted. So the tension and concentration at the time knowing “this is history” almost can’t be recreated today. I also remember bringing my kids to the Air and Space Museum in D.C., and letting them watch the video of the landing. They watched the whole thing four consecutive times before I was able to move them along to other exhibits. Great is great, no matter when, even it happened over 30 years before. It’s heartening to hear people who understand the value of space exploration. This is a value that can be expressed in economic returns, knowledge gained, and spirits inspired. And that is the wonderful thing about the human spirit. The fires of inspiration are hard to put out. Although our government may no longer have the drive to send people up, a few inspired people have kept the dream alive. SpaceX, Virgin Galactic, XCOR, Bigelow, Orbital Sciences, Planetary Resources are all based around people who continue to see the potential of mankind. I loved seeing this video of the landing — especially because I was unable to watch on TV when it really happened. I was living in Italy, doing research on my Ph.D. dissertation in 1969. We had no television, and on the day of the landing, we were actually traveling to Rome with my visiting parents. No TV in our hotel. So my Dad and I sat in the car with the radio turned on, listening to the last hour of the descent and trying to imagine it. When we heard that powerful phrase, “The Eagle has landed,” I leapt out of the car and shouted to a handful of Italians passing at the moment, “Sono scesi sulla luna!” (“They’ve landed on the moon!”). I could barely control my excitement. But to see it again, “live,” with the voices we heard over the radio long ago, was exciting again. Thanks so much. That video is tremendous. I watched it with my son and he pointed out the blurred remains of the LM descent stage under the superimposed image of the LM on the LRO data. Seeing the rocks that he had to fly over and hearing all of the uninterrupted audio was wonderful. Glad you made the trip sir! I envy you your chance to see Neil Armstrong — I was 8 when it happened and haven’t been the same since! Am I the only one who remembers the TV image of Neil Armstrong coming down the ladder… upside down? I remember the TV image as having been flipped somehow, but eventually the techs got it flipped back. They were almost out of fuel, being steered toward a crater…and from their voices you’d think they were heading to the 7-11 for chips and soda! This is what training, training, training does, you take the steps without hesitating or screwing up. I work on an Air Force base, and the officers of today are just as disciplined, smart and focused; I think maybe they are all trying to live up to the example the space program has set. We are so lucky to have people of this caliber in our lives, we need to stop focusing on murderers and let’s see some coverage of the Mars probe Curiosity! Maybe we’ve slowed down, but we’re not out yet. I am one of the fortunate few to have heard Neil Armstrong speak and to meet him personally. He was a hero to me since I listened to the moon landing radio broadcast. I was attending an American Animal Hospital Association conference in San Francisco in 1990, where I was ecstatic to hear that he would be the featured speaker at the main banquet that weekend. His talk was both inspiring and humbling, as much so as the man himself. Afterwards, we stood in line to meet him. My turn came, he graciously signed my program, then I boldly asked: “Which foot was it?” He looked momentarily startled, then grinned, pointed down and said, “That one.” “May I touch it?” The grin got wider. “Sure, go ahead.” I have touched the shoe holding the foot that first stepped on Earth’s only natural satellite. I’m wondering if it’s necessarily a bad thing for the US to be “exporting it’s knowledge” as it were rather than keeping it to itself and retaining all the benefits domestically. Now, don’t get me wrong, promoting “critical thinking” over the current educational system is to be encouraged. And, during the Cold War, I doubt the Soviets would have shared anything, so developing stuff domestically and keeping it there was the right way to go. But, isn’t “sharing” your knowledge a good thing as well? Why keep it to yourself? Apollo 11 wasn’t just Armstrong’s achievement, but also Aldrin’s and Collins’. Similarly, why can’t current space endeavors be not just America’s achievement, but something say Europe and India can take credit for as well. Maybe this is just the fact I’m not an American is why I’m saying this, but I always think that knowledge is meant to be shared, not kept to oneself. Neil is notoriously shy about the public eye. Glad to read that a “first light” party drew him out. Buzz Aldrin seems to not mind picking up the PR slack, thankfully. Is that just personality types or did Neil have a celeb overload experience that keeps him from the public eye more than this member of the public would like? As an NROTC midshipman at Southern Cal from 1969-1974, I was privileged to attend a seminar by Neil Armstrong called “Techniques of Lunar Landing” soon after his famous journey. The lecture was in partial fulfillment of his Master’s in Aerospace Engineering degree from USC. I still have the program. I always liked the first words from the moon without the “a”. It provided a meaning of victory for all mankind, rather than just one nation or individual. Totally cool! Thanks for sharing the experience. Sad that we won’t have these pioneers around for too much longer, and even sadder that we haven’t left earth orbit since Apollo 17. NASA has been a political football for too long. The only reason Pres. Johnson didn’t cancel the Moon mission was his admiration for his former boss, JFK, and America’s desire to fulfill Kennedy’s dream for us. Thank you JFK. Without that we may have never gone. Constellation is dead, despite Neil and others petition to our current president. No respect there for these pioneers. Perhaps NASA can find a future where men have a place in space. I’m hoping private enterprise doesn’t botch it and we pull back even more. Thank you again. I’ve never had the honor of meeting Neil Armstrong, although some years after STS-3, I was part of an audience with Chuck Yeagar relating his experiences as a test pilot. The man tells a great story! All in all, another set of circumstances that fate put me in at just the right time to enjoy memories of an era. Just after Armstrong returned from his historic trip to the moon, I was talking to a neighbor. At that time, we lived in Tucson, AZ and I was a mining engineer working at one of the local copper mines, and my neighbor worked for the Smithsonian Observatory on Mt. Hopkins south of Tucson. I asked what he thought of the moon landing, and he told me he was in charge of aligning the laser at the observatory. I was amazed that we had that capability and discussed it with him. He told me they can measure the distance to the moon within inches and I remarked that it seemed almost impossible to align a laser to hit a small spot on the moon and he assured me it was possible and he was doing it. Amazing! Great blog and keep it up. I remember staying up to watch the landing with my family. 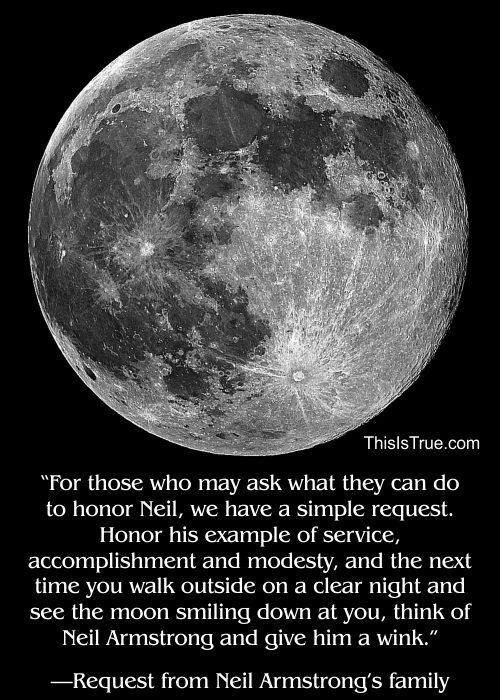 I was in High School at the time and was truly impressed with what neil Armstrong said “One step for man…” meaning all humans! But I will never forget my grandfather saying that it was a hoax and was filmed in the desert! He believed that til his dying day. I’m sorry to see that you were only just in time to meet Armstrong. May he rest in peace. I try to carry dollar coins with the Eagle landing on the Moon. Just go into any bank. Most folks under 40 have no clue about the meaning. Very sad. We bought a TV to watch the landing — I was 12. It will be one of the things I will always remember. I actually find it sad that there are those who think it was a hoax. Do they thing the Russians would have let us get away with a hoax like that? The Hoax folks either have no imagination or much more than normal to refute all of the evidence. Here are Earth-based telescopes that can see the LEM bases. And — never miss a chance to hear Story Musgrave. His performance art would make a southern Baptist preacher envious just on technique. It’s been 15 years and I can still “Feel the Power”. Randy: according to NASA the laser beam is approximately 4 miles wide at the moon’s surface. I thought that it was interesting that only 1 photon every few seconds actually makes it back to the receptors here on Earth even in the best of conditions. I was only 4 at the time, and have only a few, vague memories, more of space launches than anything specific about the landing. Thank you so much for sharing your experience with Neil and for the links you provided to help those of us see what we cannot remember, or (in many cases) what happened before our lifetimes. I was at Neil’s talk in Flagstaff as well, sorry I didn’t recognize you in the crowd. Astronomers look just a little awkward in tuxedos, don’t you think? What a great story. I was privileged to have attended a dinner with Buzz Aldrin hosted by the Los Angeles Adventurers club recently. The eerie vividness of our collective memories of that day 45 years ago still amazes me, I was in second grade…. What an absolutely *MAGNIFICENT* story!